You can’t help but think “Fairtytale Wedding” when you think of England and the British Isles. Perhaps it is because so much fairy folklore comes from these beautiful countries. It’s nice to see how many whimsical wedding traditions have been born out of these countries and even if you are typically a non-traditionalist and don’t believe in rituals or superstitions you have to admit that some of these are kind of cute. We all know the little ditty that goes “Something old, something new, something borrowed, something blue” but did you know that the ditty ends with “and a sixpence in her shoe”? This custom that is often upheld here in South Africa comes from England. Traditionally the wedding dress was considered to be “something new” while the garter was usually made blue to account for “something blue”. The veil and a piece jewellery or a handkerchief belonging to either the bride’s mother or grandmother would fill the positions of “something old” and “something borrowed”. The sixpence in her shoe was meant to bring luck. Traditionally Irish brides wore blue and not white. Blue was a symbol of purity before white came to be a colour that represented virginity. 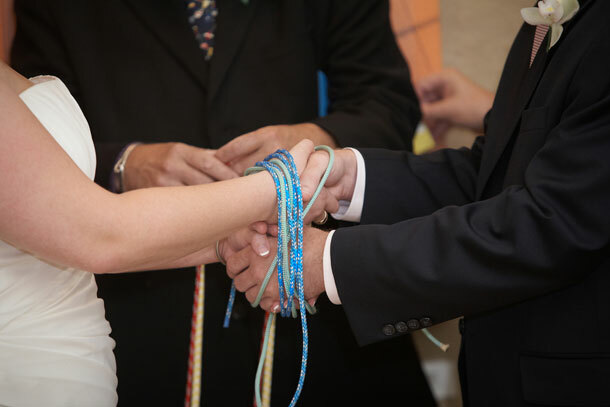 The phrase “Tying the Knot” comes from the Celtic tradition where a bride and groom participated in something called Handfasting. At the beginning of their marriage they face each other and hold hands, left hand in right and right in left so as to form the infinity symbol with their arms. Their hands are then tied together with a ribbon. Many Irish brides wear their hair in braids on their wedding day because braids are a symbol of feminine power and luck. When a Scottish bride steps into the bridal car it is customary for the bride’s father to throw a handful of coins out of the window. This ritual is believed to bring financial luck. It is customary for the best man to give the wedding couple a clock as a gift and the maid of honour is expected to give them a tea set. Another Scottish custom still practiced today is for an older married woman to wash and dry the feet of the bride. This is to guarantee good fortune in the marriage. A Welsh bride is traditionally “kidnapped” by her family on the day of the wedding and the groom and his family set off to go and “rescue” her. It is believed that whoever is responsible for the actual freeing of the bride will themselves be married within a year. It is considered a sign of very good luck to accidentally tear your wedding dress on your wedding day in Wales. I love reading about the various traditions – keep them coming! I can’t imagine that any bride would be happy when accidentally tearing her new and expensive wedding dress, although seeing that this brings good luck, I may just walk past anything and everything with sharp edges.